This volume commences a survey of Beethoven sonatas which will couple the well known, in this case the ‘Appassionata’, with the comparatively neglected, here the grandest of Beethoven’s early sonatas, his Op. 7. The disc is completed with a performance of Op 10/3, one of the early sonatas where Beethoven can be seen breaking the bounds of convention to create the style which would define the great works of his middle period. 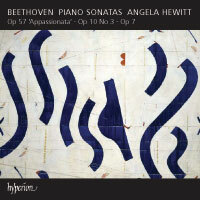 A new recording of Beethoven Sonatas might seem superfluous these days, but in these works, the pianistic hallmarks of Angela Hewitt’s Bach are also to be found—clarity, attention to detail, singing lines and, above all, a rhythmic drive which energizes and propels the music forward. This looks like being the start of another very important series of recordings. This recording is available in multichannel hybrid SACD and conventional CD formats. ‘As this impressive new disc shows, it is a mistake to try to pigeon-hole Angela Hewitt…. (she) invests the slow movement of the E-flat Sonata Op 7 with the “great expression” Beethoven called for. Elsewhere in these sonatas, the music is enlivened by Hewitt’s rhythmic zest, strength of accent and lucidly animated textures, her Fazioli piano adding brilliance to the timbre. Clarity, elegance, intelligence, a belief in letting the composer speak: the winner of the Gramophone Artist of the Year award parades her qualities in the first of a new Beethoven series that balances the overfamiliar Appassionata with the connoisseur’s Op 10 No 3 and neglected Op 7. There’s not a dead note anywhere. The largos find her piercing the depths; she’s equally impressive at quicksilver turns and tumbling cascades. Enjoy a masterclass in your own home - subscribe now and get instant access.